FAIRMATE PREMIUM EPOXY TILE GROUT is a thixotropic, 3 Packs Water dispersible Epoxy based tile grout ideal for all type of tile joints. FAIRMATE PREMIUM EPOXY TILE GROUT is an eco friendly & also it provides excellent adhesion even under damp condition. FAIRMATE PREMIUM EPOXY TILE GROUT is available in range of colours, easy to mix and apply. Tile gap width of 3 mm to 12mm gap can be filled easily with FAIRMATE PREMIUM EPOXY TILE GROUT. Excellent resistant to acids & chemicals. FAIRFIX PREMIUM EPOXY TILE GROUT is used for all types of Tile Joints including ceramic, porcelain, vitrified tiles, marbles & stones. It can used in residential and commercial floor/wall applications, swimming pools, kitchens, bathrooms heavy traffic areas such as subway stations, shopping malls and airport terminal buildings. 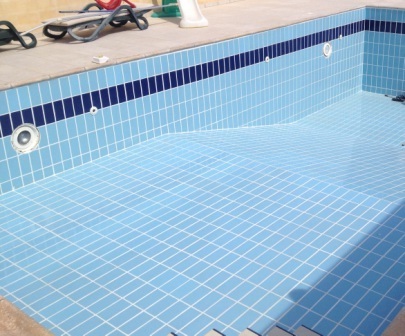 Surface Preparation: Substrates (tile joint) should be sound, clean and free from dust, dirt, grease, oils and other contaminants. A roughened or profile surface will ensure optimum adhesion. Mixing: Empty entire base and hardener components into a clean mixing pail. Mix thoroughly using a stiff spatula or slow speed drill with paddle attachment to get homogeneous mix. Then add the coloured aggregates until a uniform colored mixture is obtained. Application: Immediately pour the entire mixed FAIRMATE PREMIUM EPOXY TILE GROUT to the prepared substrate by using spatula, trowel, serrated trowel or stiff bristled brush depending on the gap of joint to be treated. Remove as much as excess material as possible before initial cleaning with grout float. Do not leave excess grout on the face of tile. After 45 minutes of the application of the grout scrub the surface of the tile & joint with clean water and scrubber to remove any excess grout. After 24 hours clean with soap water to remove any undesired spot from the tile.